Predictable rarefaction of petroleum, the main resource for the production of current consumer goods (chemicals and polymer) has led since the 80s to an approach in industrial nations for replacement of the fossil carbon resource by renewable resources, with an increasing development of the « green chemistry » concept and resulting bioproducts. Agricultural biomass is a plentiful and renewable resource. The Europe 2020 strategy aims at a sustainable growth to promote a more effective economy in the use of the resources, greener and more competitive, based on three major orientations for the development of the biomass, bioproducts and bioenergy programs. The production from oil asks for a long process while the chemical structure of products from biomass and their properties can be satisfactory with a reduced industrial treatment, allowing competing with fossil productions (biodegradability, functional properties, less need of additives). The bioraffineries emphasizes on the concept of valorization of the total plant for a multipurpose crop of bioproducts to bioenergy, uses innovative process for the development of biotechnologies. With growing sustainable development consciousness, polymers or chemicals based on renewable materials will replace gradually polymers and molecules of the petrochemistry in this century. The EAGLES project aims at setting up an entire production chain (multipurpose crop) biomass production by farmers, latex and rubber other extracted bioproducts, monomers and polymers and end products. 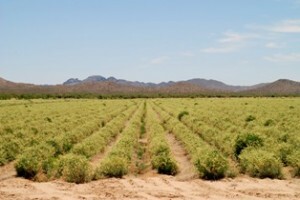 Guayule will be grown in four Mediterranean countries. Latex, rubber and bioproducts of the Guayule biomass from a 5 hectares Guayule field planted in Spain will be extracted in a pilot plant using the bioraffinerie concept, with no solvent but a water extraction process. Products of the extraction process will be incorporated into production chains of end-users. The project will develop specialty niche market in Europe for Guayule non allergenic latex and derived byproducts, with applications and added value in the chemical, medical, automotive, plastics, adhesives and wood industries.